Exercise has multiple benefits for everybody. But for people suffering from Parkinson’s, a movement disorder, it can have even greater importance. A recent article by the New York Times emphasizes the power of exercise for Parkinsons Disease patients. Unfortunately, there is no cure for Parkinson’s Disease (PD), but there are ways to mitigate the suffering, promote a higher quality of life and autonomy. Exercise is one way of doing it. The New York Times quotes Marilyn Moffat, physical therapist at New York University: “The earlier people begin exercising after a Parkinson’s diagnosis, and the higher the intensity of exercise they achieve, the better they are”. She adds that activities such as cycling, boxing and dancing have proved to have benefits on Parkinson’s patients’ lives. The results are stronger muscles and overall physical health, improved breathing, diggestion and blood circulation and enhanced mental and cognitive health. 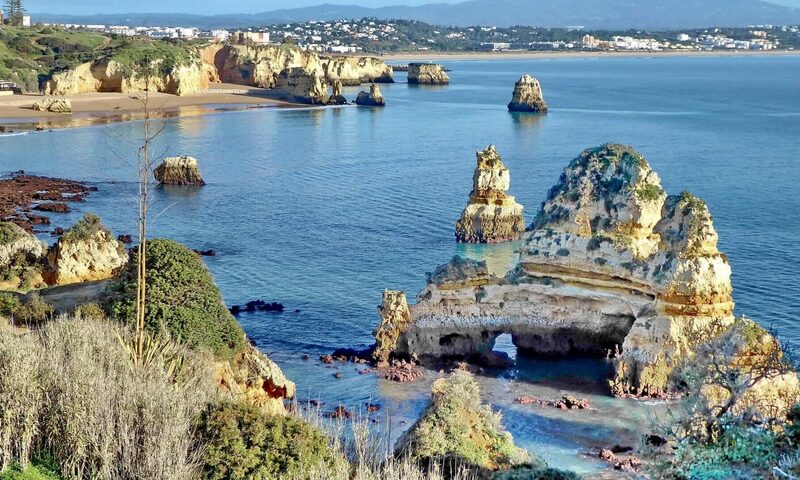 Portugal hosts an innovative and multi-strategy rehabilitation program for PD, developed by the renowned Professor Joaquim Ferreira, chair of the European Section of the Movement Disorder Society. At Campus Neurológico Sénior, Parkinson’s patients and caregivers can learn to cope with the disease, through a program that includes two main components: exercising and education. It combines multiple training programs such as LSTV BIG, LSTV LOUD, Hydrotherapy Bad Ragaz & Halliwick, Adapted Parkinson Boxing Aerobics and Dance Therapy for PD, which are adapted to the patients’ needs. If you wish to learn more about this program, contact us or visit our dedicated webpage: www.medicalport.org/parkinsons. 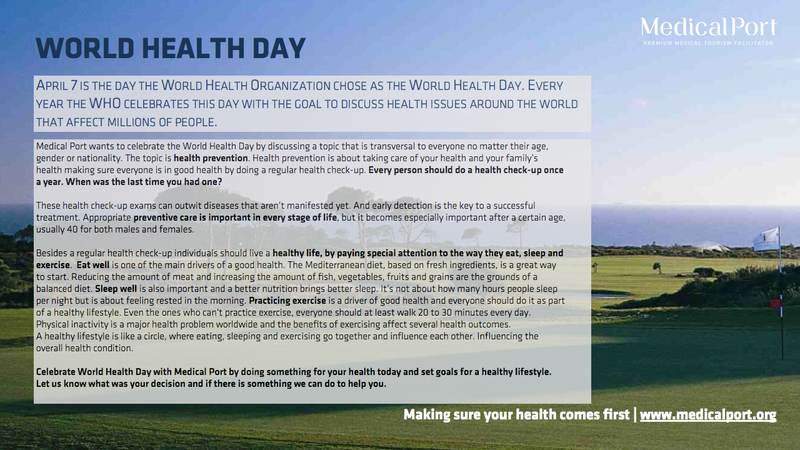 April 7 is the World Health Day. Every year the World Health Organization chooses a health problem that concerns millions and millions of people around the world and raises awareness to that problem. A healthy lifestyle increases the chances to avoid being affected by diseases such as diabetes type 2 that are caused by sedentary lifestyle and poor nutrition. Eat well and be physically active are two of the most important tips for those who want to live longer. Read the full article on the World Health Organization’s website, here. High blood pressure, also known as hypertension, is a disease that affects millions all over the world. According to Medical News Today, the number of people living with hypertension is predicted to be 1.56 billion worldwide by the year 2025. There are several reasons pointed as the triggers of the high blood pressure increased incidence in Europe and in the United States. The contemporary lifestyle choices related to lack of physical activity, increased salt consumption, alcohol and tobacco consumption are pointed as some reasons. Because this is a silent disease with no visible or painful symptoms, alarming numbers of people suffering from it. In order to first treat high blood pressure, patients are advised to make lifestyle changes such as salt restriction and other diet changes. Those who suffer from hypertension are those who are more likely to suffer from other complications which can be very serious and sometimes fatal, like heart failure, aneurysm, blood vessel narrowing (for example, leading to kidney failure or heart attack). It is important to keep track of blood pressure specially when people start ageing, as this condition tends to affect more and more people, as they get old. It is very easy to do it at home or at the pharmacy. Hypertension can be diagnosed after a doctor has measured the patient several times and high values are most of times present. Keeping track of your health condition is important to prevent future diseases, and the best way to do it is to maintain an active lifestyle associated with regular health check-ups. A balanced diet is also very important, and reducing the salt intake is key to lower blood pressure. If you would like to know more about reducing the consumption of salt please read our previous blog post here. The month of September usually marks the beginning of new decisions and new goals. It is the month that marks the end of summer and the beginning of new cycles such as the new school year. With new beginnings comes the desire to define new healthy goals and to live a healthier lifestyle. Some foods can help you get slimmer, make you live smarter and even longer. Depending on your goals, there are plenty of seeds that can be very good for your health. Those who embrace a healthy diet are also more likely to improve their cognitive skills and fight memory loss that comes with aging. When healthy food groups are preferred over saturated fats or high amounts of sugar, the brain responds positively as people age. A study by the American Academy of Neurology in over 40 countries and lasting more than 2 years concluded that higher diet quality was associated with a reduced risk of cognitive decline. Seeds are among some of the healthiest choices one can make. They are usually rich in protein, low in sugar and saturated fat and they will make the perfect add-on to your favorite snack. Sesame – they have a good satiating effect and they act as a shield to the heart. The best way to eat them is in snacks like yogurts, or in soups, juices and salads. Contain proteins, omega 6 and omega 9. Flaxseed – these seeds are known for regulating the intestinal transit and for being a good substitute of the regular wheat flour (which contains gluten) for traditional flour recipes. Contains omega 6 and omega 9. Sunflower – their action against the early aging of cells and tissues is proved and they go well with salads, juices and soups. Contain omega 6, minerals and vitamin E.
Chia – a source of energy and resistance these seeds have become very popular in the last few years. They can be used in salads, juices or added to cereal bowls. They contain fiber and calcium. Pumpkin – these seeds have antioxidant, anti-inflammatory and diuretic properties. They can be consumed in yogurts and salads. Adding seeds to the diet is an easy and tasty way to start making healthier choices and to get the best of the food intake. The better the nutrients in our diets, the better our physical and mental health will be.